"Your sunshades of high-quality fabric prevent glare and reduce heat to make the car trip more enjoyable. 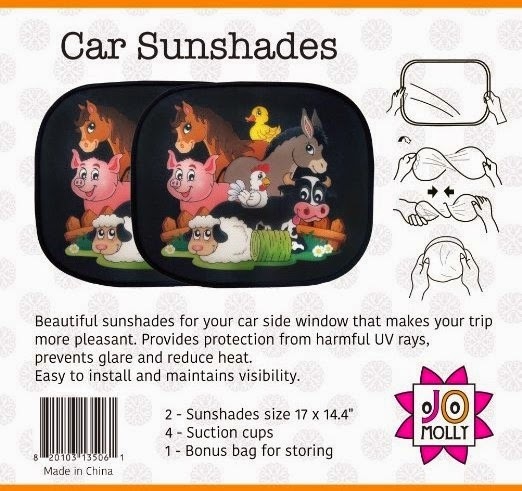 Why let your children look at a boring black sunshade when they can have these beautiful shades with farm animals? They take up very little space when they are not in use. Put both of the sunshades and the suction cups in the free bonus bag when you do not use them. That will protect them and make sure that they keep their good quality for many years. Do you often move your sunshades around? Don't worry, these sunshades will stick to your car window over and over again and they do not leave marks on your window after you remove them. You will see that there are no wrinkles in the fabric when you unpack them." I was sent a 2-pack of the farm animal car sunshades from Jomolly to review. This set costs $16.95. Shipping is free. These sunshades arrived in perfect condition. They were sent in a cellophane bag with an insert. The insert detailed more about the sunshades. It also listed the contents of the package. The sunshades arrived zipped up in their storage pouch. There are (4) suction cups, and they were placed on the inside of the folded sunshades. The sunshades are adorable! They are illustrated with cute farm animals. Having a small baby really warrants the use of these. The days are getting hotter, and the sun is hanging around a lot more frequently. I love the storage pouch. The illustration is so cute! I'm glad that they are sold in a pack of two. I haven't found any cons of these sunshades. Not only do I love these, but my daughter does, too! When I hang them up in the window, she just stares at them. I guess they provide a bit of entertainment as well as protection! 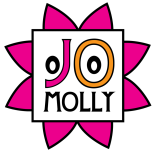 Are you wanting to try Jomolly's Car Sunshades, too? Click the link below, and order away! Thank you so much for your review of our car window sunshades! I am very happy that you like them and you did an awesome video review.